Available exclusively in the UK from Ixthus Instrumentation, two new Hardy Portable Shakers from Metrix Instrument Co. offer significant enhancements for self-contained vibration condition monitoring and sensor validation. 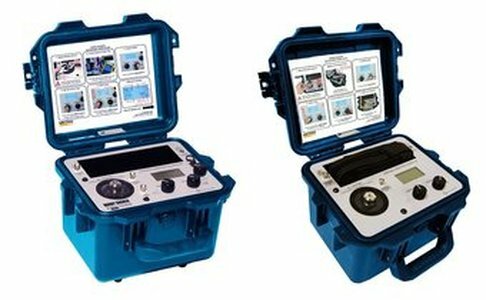 The new CE approved HI-903 and HI-913 series vibration reference sources effectively replace and improve upon the previous non-CE marked HI-803 & HI-813 models. The two service levels are both rechargeable battery powered for field use with the HI-913 designed for convenient validation of the entire channel of transducers such as accelerometers, velocity transducers and proximity probes through measurement, monitoring or recording systems. The unit is designed to provide NIST traceable transducer verification and features USB data transfer for a calibration test. The more advanced HI-903 model is a complete turnkey system for calibration and certification of individual sensors, vibration switches and data collectors, as well as validation the entire measurement channel. Straightforward certificate of calibration preparation is available through a supplied Excel template. An ICP® or voltage test sensor input allows direct connection and readout of the most common types of accelerometers and velocity transducers with the test sensor sensitivity calculated and displayed on the screen in real time. Other additional features include an internal USB flash drive memory that can store up to 500 calibration records with data transfer to a computer. Both models offer a maximum payload of 800 grams, with a wide frequency range of 7 Hz to 10 kHz (420 to 600000 CPM). The bandwidth for acceleration, velocity and displacement measurement is more than adequately covered and a comprehensive variety of readout units ensures straightforward use for all types of sensor measurement. Rugged shaker element design includes carbon fiber composite armature flexures. The new models are designed for complete portability and are housed in sturdy but lightweight Pelican® Storm cases for maximum durability. Ixthus Instrumentation supports the complete range of Hardy Shakers as the exclusive UK distributor for Metrix Instrument Co. The older HI-803 & HI-813 models are still available for sales and support from Ixthus but do not offer CE Approval and many of the features of the new versions.